Some pituitary gland problems and growths should not be surgically treated. Prolactinomas and microprolactinomas should always be treated with medications or radiation, or both. Even if surgery becomes necessary other measures should be used to shrink the growth before the surgery. Pituitary gland surgery usually involves a general anesthetic, and these procedures carry the same risks as other surgeries which involve these drugs. In addition damage may occur in healthy tissues surrounding the growth. Your surgeon will outline all the risks involved with your procedure. The recovery time needed can vary significantly, depending on whether you have a pituitary microadenoma or pituitary macroadenoma, as well as the location, surgical procedures used, and other factors. In some circumstances, your pituitary gland surgery may be followed by radiation or other treatments to ensure any cancerous cells have been destroyed. This is especially true if there is any doubt that all of the affected tissue has been removed. 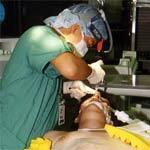 Modern pituitary gland surgery can be done without leaving any scars in most situations. The surgery uses your nasal passages instead of making an incision to reach the pituitary gland, so there is no scarring and less recovery time is needed.